The first time I stood in front of Notre-Dame de Paris, I was 16. It was for a high school field trip for students who had included a second language in their curriculum. The airline had lost my luggage, and I was working my airplane outfit well into day two of the trip. But, in that moment, looking up at the Cathedral’s rampart-like structure, the divine French Gothic architecture, the gargantuan, north and south towers and the ghastly gargoyles – a mash-up of holiness and hideousness, it just didn’t seem to matter. 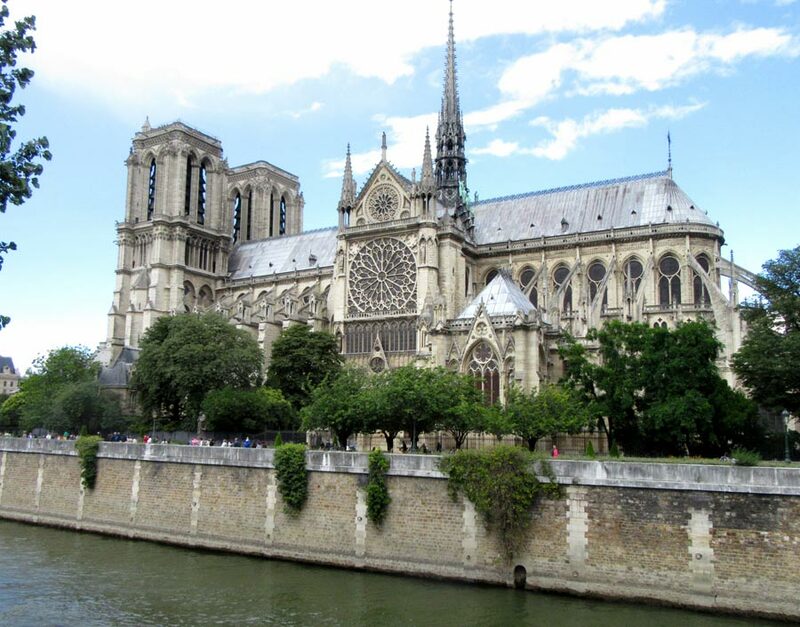 Victor Hugo’s hero, The Hunchback of Notre Dame, certainly wasn’t donning his Sunday best while hiding in his sanctuary, haunting the rafters, swinging the bells’ ropes, and neither had I.
I was simply awestruck. Being a kid from a relatively young Canada, there wasn’t a lot of architecture that compared. It was built, starting in the 1100s, on the ruins of a Roman Temple, defiant in its opposition to paganism. The second time I stood in front of Notre Dame, I had a child of my own. I had an 18-month old daughter, and both my mother and I needed a well-earned holiday from being, well, mothers. Where else, but Paris? It had been raining quite a bit, but we braved it, hopped on a Bateaux Mouche that paddled along the Seine, and up to the Île de la Cité. This time, it was both of us. Drenched from the deluge, yet again, completely oblivious to the weather in the shadow of the medieval Cathedral, its 19th century spire sharpening the square edges of the fortress-like place of worship. Inside, the relic of the Crown of Thorns was among irreplaceable treasures still housed here — many of the precious art works were destroyed or lost during the Cathedral’s sacking by French revolutionists in the late 1700s. The stain-glassed lacked that bit of lustre that comes when the sun pours through, its arches, flying buttress and vaulted ribs stained wet from the rain, giving it a patina that paired well with its age. The third time I stood in front of Notre Dame, I was on my own, but not alone. I had opted to travel with a group, a coach full of like-minded people who all wanted to see the sights anew, up close and a little more personal. Night had fallen, and the cathedral was lit up in all its imposing splendour. It might have been a trick of the eye, but it seemed the façade was a bit brighter after dark. Our Lady had been given a fresh cleaning. She glowed. Heavenly. On April 15, the day after Palm Sunday, a different glow came from Notre Dame. One of damage and havoc, tearing through a thousand years of architecture, of history, of hallowed walls. 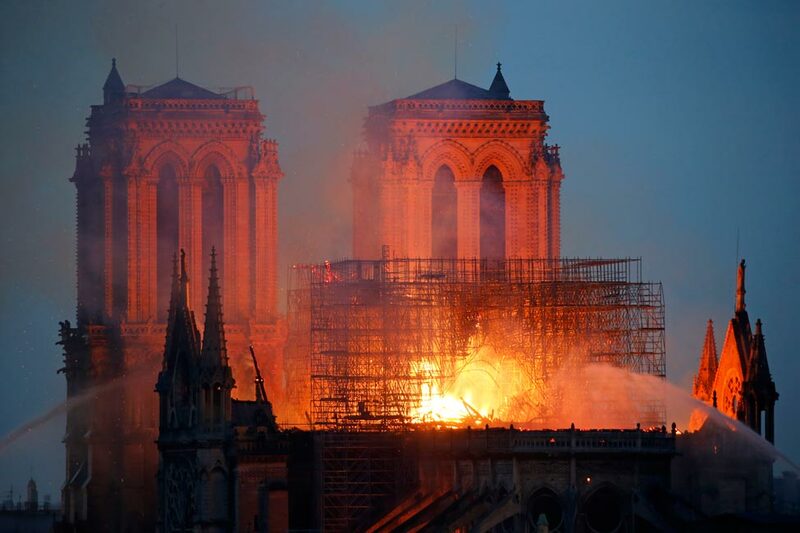 The cathedral was undergoing renovations, and a fire broke out. (Shades of Windsor Castle in England, and a similar disastrous fire in 1992 blamed on renovation materials, comes to mind.) The spire that pierced the sky on my first visit no longer stands, the roof is gone, exposing much of the cathedral, which was just in the beginning stages of a facelift, and is now one of the suspects of the causes of this devastating fire. A monument, a sanctuary, a beacon, now reduced. As I write this, and as fire fighters fight the flames and time to pull out what precious relics and artworks remain, the towers still stand, the gargoyles lining the Gallery of Kings in many spots still grimace, the 16 statues that overlooked the cathedral from outside on its grounds have survived. The ghosts of The Hunchback and his heart’s desire, Esmeralda, will still haunt the stone walls. She may be down, but let’s hope Our Lady is not out.